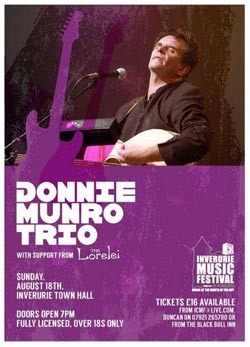 We are delighted to confirm The Lorelei will be supporting the Donnie Munro Trio on Sunday 18th August at the Inverurie Town Hall. Donnie will be the closing act on the first ever Inverurie Community Music Festival Tickets are on sale now priced £16 each available from icmf@live.com, Duncan on 07921 265780 or the Black Bull Inn in Inverurie. Get your tickets quick as this is likely to be a quick sell out!